About Corn and Mushroom Tostada Recipe: Tostada is a Spanish word which means 'toasted'. 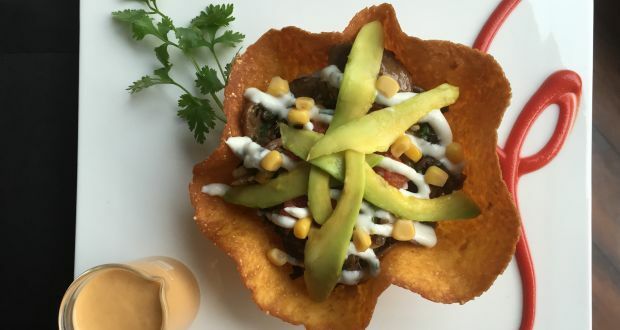 A crisp fried corn tortilla topped with a medley of mushrooms, herbs, chillies, coriander, avocado, salsa and sour cream by Depot 29! 1.Saute mushrooms and garlic in olive oil. 2.Add onion, thyme, green chili, coriander and mix together. Add salt to taste. 3.Roll and fry a tortilla sheet into a bowl like shape. 4.Put the above filling in this cup. Garnish with tomato salsa, avocado slices and sour cream. 5.Serve with a side of cheese dip.